Just curious, Gary -- how far north are you going to go? Are you planning on doing Bahama? I'd always heard that the pool and pool house (N corner of N.Duke and Frazier) and the horse stable that used to be on the corner of N. Duke and Pendergrass (when Pendergrass ran all the way through) were part of the Teer property. Does anyone know for a fact if that was true? the teer house and grounds are the brightest highlights of my drive on roxboro to nccu. god, i love those trees. I was raised there. The "Pool House" and Olympic sized pool was built in 1954. Duke did away with the pool due to liability. The "Stables" housed several "World Champion" horses for the grandchildren of Nello, Sr. The Teer property included many houses down to Newsome Street, for employees of the Teer firm. Cow pasture lands went to Fairfield on the north and west to Duke Homestead. And far east, alpha fields behind what we developed for L&M tobacco Co.
Not sure if this is of interest to you or not, but I just found something in some genalogy files of Henry Floyd Picket that say the Teer House was built for Nello Teer by John Washington Pickett (1868-1952). The apartment used to be where Winston & Julia lived from 1920 until 1950. They were my grandfathers cook and maid. The room down stairs is where a large wood buring stove usued to be...for slow cooking BBQ. The more beautiful home of Nello L. Teer Sr. was across the street at 4020 N. Roxboro Rd. Former Durham County Comissioner Edwin B. Clements Sr. purchased the home and lived there until it was purchased by Gary Hock and later torn down. There should be photos of that home on this site as well. 4020 Roxboro Road was built by my father, Nello, Jr. in 1940 to raise his family. We switched homes with Sr. in 1950, the 4019 home....a much bigger home. Then my father (in fact, quite a few in the family) used to work for your father and uncle (Dillard Teer). He thought highly of them both. I'd be very interested in what you migth remember about the building of the other houses in the neighborhood, the ones you say were for Teer employees. I assume you mean between N. Duke and Roxboro Rd.? I've never been able to figure out why the Roxboro road end of the neighborhood is so different from the North Duke end. No Gary, Nello Teer Sr. also had a house directly across the street that he later moved into when his son Nello Jr moved into the "Teer House" maybe around 1945. They swapped houses. The one across the street was also massive. Next door to the south was Bonnie Brae. Yes, I've since learned about this house - the 'Little House' across the street (4020) stood to the north of Bonnie Brae, built by Nello Jr. and then, evidently at the request of Nello Sr., they swapped houses. In response to the earlier comment - I'd be happy to put a picture of that house on the site if one exists; I've never seen one. I've spoken with some of the Teer family about this, but if any pictures are out there, please send them to me. I agree. I am Ed Clement's grandson. I would love for photos of that house to be on here as well. My grandfather said if he had known that it was going to be torn down he would have never sold it. If I can find some photos of the house I will try and submit them. There are a number of totally wrong items in this article. Do you want them corrected for historical sake? Page- I'm not aware that there is anything "totally wrong" - everything is sourced, so someone else (other than me) has a version of this history that you disagree with, clearly. But why don't you simply write what it is that you take issue with - or your version of the above. That would be helpful, and yes, the goal is to have the history be as accurate as possible (or to present the not-uncommonly conflicting versions.) The "totally wrong" commentary just isn't very helpful or nice. I am Dillard Teer's grandson and have reviewed this article. This all seems to be spot on. If there is any question of authenticity then I would ask Robb Teer or Dillard Teer. Page is a great guy but does seem to confuse our families history on occasion. Thank you for the interest in my family! To J Ray Rex - Do you remember which houses these were? Would be nice to know, especially now that the northeast part of Newsome has been torn down for parking lots. If I had to guess, I'd bet you are talking about the brick houses on the part near Duke Street to the south of where the stable used to be, but it would be nice to know for sure just for history's sake. Gary, you might want to take a look at Newsome. The houses aren't all that remarkable compared to the Teer property, but SOLO Properties seems to be determined to snap them all up and tear them down. The last paragraph of the article, though, was about this house. It says "As the young contractor is still in his early 30s, he is just at the start of a most promising career. He recently completed a beautiful $30,000 residence for himself and family, three miles from Durham, North Carolina, where his front yard is a timbered park of 17 acres. `Even if I go broke', he explained with a smile, `I shall have had the satisfaction of building a fine home for somebody.' "
The last of the large 'summer houses' of Durham's early industrialists along Roxboro Road to remain standing in its original setting/location, the Teer House was built in 1920-22 for Nello L. Teer. (Conflicting sources say 1915.) Born in 1888, Teer started work in the East Durham brickyard of his father, Washington Teer after having dropped out of school at age 9. A work accident amputated his right hand in 1906, ending his brickmaking career. However, by 1909, he started his own paving business, early on winning contracts to macadamize Durham's roadways. His immediate success is evident in the construction of this house 6 years later, when Teer was 27 years old. Over time, Teer built his paving business into a major company that paved thousands of miles of roadways - throughout NC, the US, and the world, including the Pan American Highway in Central and South America. Nello Teer's brother and partner in the company, Hubert Teer, built another well-known house in Durham: the large colonial revival house at Chelsea Circle and Hope Valley Road with miniature version of same in the yard. 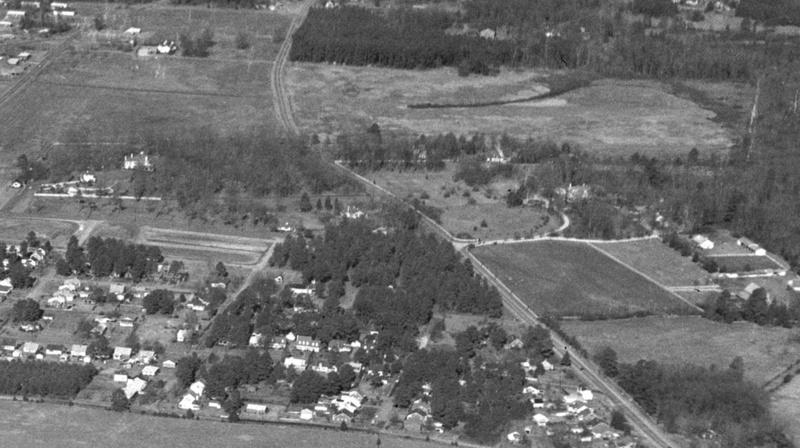 Aerial showing the Teer house just to the north of the housing development; Bonnie Brae - Richard Wright's house - is to the right, across Roxboro Road. Per "Courage Ever: An American Success Story: Nello L. Teer Sr. and His Company,"
Rigsbee and Lawrence Construction Company in Durham, NC built the Nello L. Teer Home Place on Roxboro Road between 1920 and 1922. Designed by Milburn, Heister, And Co., and architectural firm based out of Washington, DC. the project was overseen by Mr. Telphor Lawrence, who served as Superintendent. Until the mid-sixties, the home place was known as Woodland Terrace. Though the home place and its immediate surroundings sit on ten acres of land, Mr. Teer's entire property consisted of 52 acres. He kept his company equipment and maintenance facilities on the remaining property until 1956. Having spent his childhood on a farm (on Burch Avenue,) Nello decided to build horse stables behind the house. He also dabbled in the dairy business as a hobby and hired two men to milk his Guernsey cows seven days a week. With a fully functioning dairy on the property, Nello regularly supplied his family with fresh milk. The house was originally red brick and the current slate roof is the original. The house was painted white after World War II and part of it was air conditioned as early as 1940. Most of the trees on the property existed when Mr. Teer built the house; however, he added many others over time. Interestingly enough, the Durham County Commissioners and the Civil Aeronautics Board tried to build the Durham Municipal Airport on the home place property in 1935, but Mr Teer lobbied against it and won. In 1947, Mr. Teer moved across the street from the house and Nello Jr.'s family into the home place. 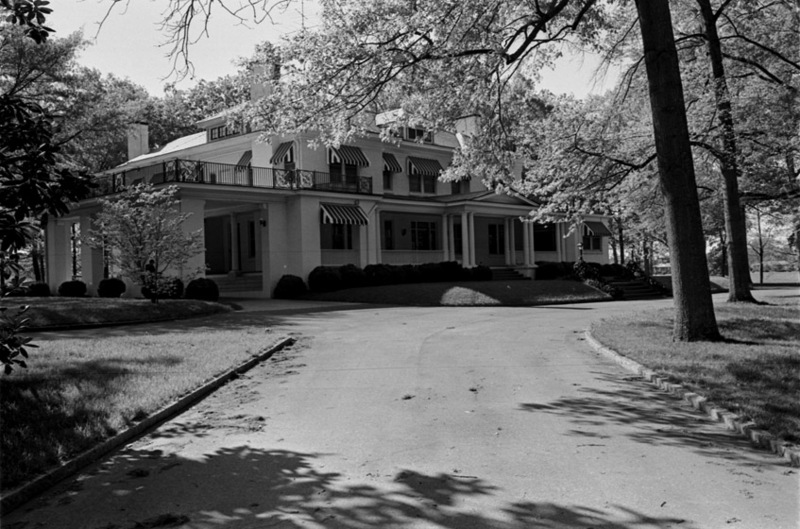 Mr. Teer died in 1963, and his sons, Nello Jr. and Dillard, gave the house to Duke University Medical Center. Dr. Kempner utilized the house for one of his Rice Diet clinics for several years, and Duke later used the house for a Faculty Club, and later yet, a nurses' training center. Duke appears to run a health system community education program out of the house now; the house and grounds have been undergoing extensive renovation of late.